Escape from the cold winter to warm clear blue pristine turquoise waters, light mediterranean winds, custom prepared gourmet dining and fresh fruits and vegetables and sunshine every day of the year. 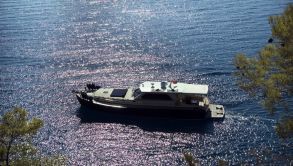 Where we can propose you a gulet charter Turkey and the greek islands. We can propose you a luxury gulet charter in Turkey that is suitable to your budget and expectations, from an all inclusive family vacation to a corporate charter group or a romantic honeymoon. swimming in secluded bays and pristine waters, Completely different and relaxing escapes from the ordinary holiday vacations you have done before. Gulet charter Turkey offers, custom prepared gourmet meals to your individual taste by your personal chef and served to you by your own stewardess. schnorkeling, sailing, water toys such as water ski, wind surf and no fixed routes or itineraries, You decide and tell your captain where to go and when to go, The gulet crew does It all but you are the most welcomed to participate in sailing Gulets or cooking as much as you like. Southwestern Turkey and the Greek islands are ideal for a Gulet, these crewed gulet charter destinations have a combination of natural beauty and the charm of traditional waterfront towns. Schnorkeling and diving in crystal clear pristine waters and relaxing in the midst of awesome scenery promises an awesome gulet charter in Turkey sailing vacations. All our Gulet Charter fleet are air conditioned yacht and we offer luxury accomodations throughout your charter, An entertainment center with flat screen tv and dvd player for you to follow your favourite tv programs. The guest rooms are glossy finished in exquisite mahogany wood and most gulets offer queen size beds and all cabins have ensuite bathrooms and individual airconditioning systems, The spacious decks and stern and forward seating areas provide numerous options for lounging and dining. gulet charter in Turkey is a voyage into sheer luxury with your loved ones, while your personal chef prepares meals and snacks based on your personal preferences. Friendly, discreet and courteous yacht crew is always there to make sure that you and your loved ones enjoy the gulet rental Turkey to the fullest. One of the most important components of a gulet cruise in turkey as an option is the first class service and utmost attention you receive. Please contact us to get a quote so that you and your loved ones can enjoy a gulet charter in Turkey and the greek islands.